Rikki Clarke will be a key man as the Bears, having reached their first Finals Day since 2003, strive to complete the job and lift the trophy on their home ground. 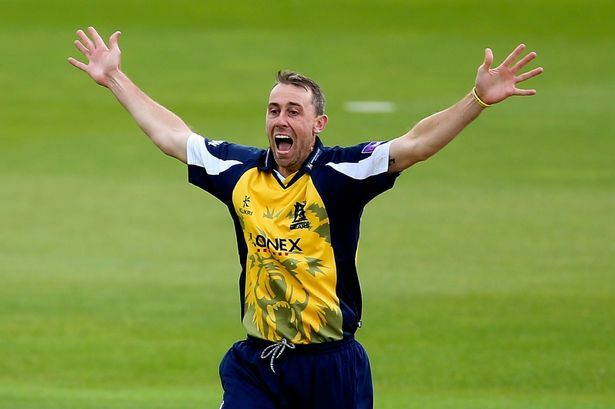 Rikki Clarke believes Warwickshire will go into Twenty20 Finals Day on Saturday as underdogs – but with a quiet confidence they will acquit themselves well in front of a packed Edgbaston. The all-rounder will be a key man as the Bears, having reached their first Finals Day since 2003, strive to complete the job and lift the trophy on their home ground. Warwickshire will face Surrey in the first semi-final, starting at 11am, aiming to book their place in the final against Lancashire or Hampshire. If they can do that, a memorable evening will be in store at the famous old ground when the final gets under way at 6.45pm. The Bears have a big obstacle in their path in the form of a Surrey side which has reached Finals Day more often than any other county. But Clarke insists they can raise their game, fuelled by a four-game unbeaten run in the format – built under pressure. To qualify from the group they had to win their last three group games, which they did before following up with an excellent quarter-final triumph over big-hitting Essex to silence a boisterous Chelmsford crowd. Warwickshire have done very well in recent weeks, competing hard in all competitions despite their squad, and the seam-bowling department in particular, suffering a spate of injuries and unavailabilities. And that augurs well for the immediate future and beyond, reckons Clarke. “To be at this stage of the season and still be in contention in all three competitions is very satisfying,” he said. “Not many counties can say that. “We have a very strong squad with young guys coming through and pushing the senior players for places which is what you need. ‘‘Hopefully we can keep this squad together and add to it over the next few years and create a legacy like the guys did back in the 1990s. “We are really looking forward to T20 Finals Day. We know we only scraped through from the group thanks to Nottinghamshire doing us a favour at Yorkshire but we are peaking at the right time. “Realistically, we are underdogs due to the simple fact that we have not been to a finals day for 11 years. Surrey and Hampshire have been to the Finals Day quite a lot and Lancashire have been there whereas we haven’t been there since 2003. The evidence from that quarter-final is that Warwickshire can deal with the demands of high-pressure knock-out duels in the slogging format. With the bat, Clarke and Varun Chopra peppered the boundary to ensure a big total. Then the fielding was sharp and, at times, brilliant and the bowling calm and disciplined led, as always, by Jeetan Patel. “It was a massive achievement to put in that sort of performance with bat and ball at a ground when they know how to play,” Clarke said. “A few guys got the plaudits at Chelmsford but, for me, Jeetan pretty much won us that game. To go for under a run a ball at Chelmsford was a massive achievement. That is true – though it helped the New Zealander to have nearly 200 to bowl at. And, in that regard, Clarke’s stroke-laden 37-ball 70 was pretty special. “I was pretty happy with the knock,” he said. “I have been used to playing down that neck of the woods in my Surrey days and I like those sort of wickets where the ball comes on to the bat with a bit of pace and bounce. “It was nice to get in to bat in those conditions with a few overs to play with. I hadn’t really had the chance much this season and the pitches tend to be quite tired when you bat later on them.